I’m actually rather flummoxed on what to say in this review…I’ve been staring at a blank page for half an hour, not quite sure how to start. This is a biography of conservationist, writer Aldo Leopold. If you don’t already know who Aldo Leopold is, then you probably picked up this book by mistake. Leopold is the author of A Sand County Almanac – perhaps the most important literary work espousing the need for environmental concerns and the need to understand and conserve our land. What is most interesting about this book is getting a sense of how Leopold grew into the role as the voice of environmental conservation. His interests in the outdoors led him to outdoor, conservation jobs right at the beginning of his career. Because of his moral (a term used in the book) persuasion, and his certainty that he was on the right path, Leopold persevered and kept reaching out to make sure his voice was heard. He seemed to be a natural leader, but declined leadership roles on boards and in companies that recruited him. He was the sort who rolled up his sleeves and got to work, rather than making policies. But what I found interesting about this book and my connection to it, was that I didn’t need this. Sometimes a biography will enhance my understanding of someone and make their work a little more enjoyable. Or sometimes a person’s life is interesting enough to be an interesting story in itself. But this was really neither on the one hand and just a little bit of both on the other hand – which is why it’s so difficult to review it. Author Julianne Lutz Warren has done an incredible amount of research and told the story smoothly and has made it about as interesting as one could expect. And still … it doesn’t enhance my appreciation for Leopold’s seminal work. As mentioned, the work is so thorough and well-researched that this sometimes feels like an autobiography, rather than a biography. And though the book comes in at over 500 pages, nearly a third of that is end-notes and bibliography. I’m glad to have read this, but I could recommend it only to those who are already fans of Leopold’s work (as opposed to people who generally like biographies) and even at that, I wouldn’t push too hard. Looking for a good book? 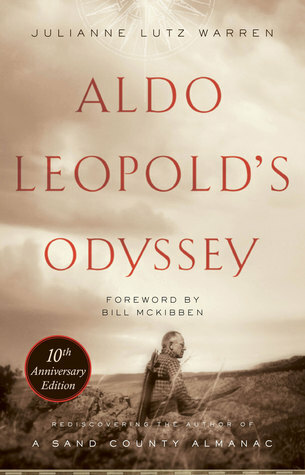 Aldo Leopold’s Odyssey, Tenth Anniversary Edition: Rediscovering the Author of A Sand County Almanac by Julianne Lutz Warren is a thorough, moderately interesting look at Aldo Leopold, but takes a special dedication to the subject matter to be truly interesting.